NVIDIA along with their AIB partners have issued price cuts on several GeForce 900 series graphics cards which are based on their Maxwell architecture. The Maxwell family of graphics cards were very popular among users in the PC gaming community and a huge success for NVIDIA in general. More than a year after the launch of the first 900 series card, NVIDIA is issuing a price cut through their partners on the high-end Maxwell based cards. We will start off with the GeForce GTX 980 Ti which is still an impressive graphics card for enthusiasts. Custom GeForce GTX 980 Ti cards have been the fastest solutions in the last generation of 28nm cards. 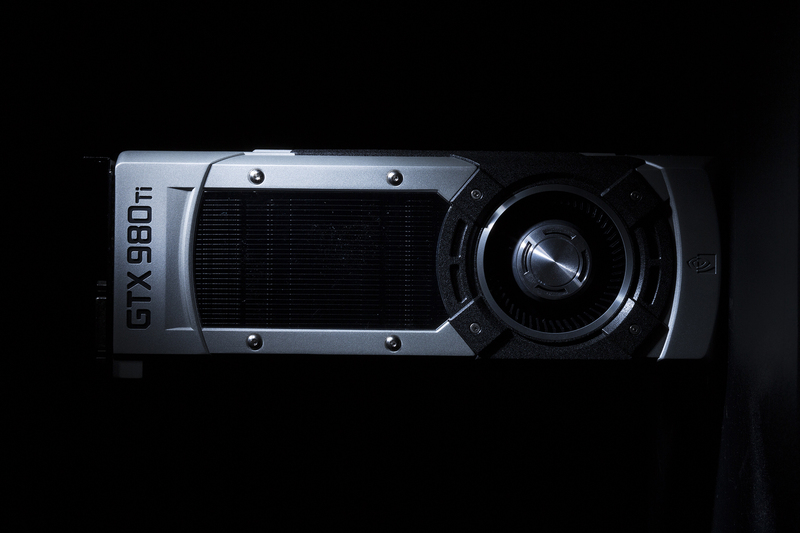 The GTX 980 Ti started its journey at a price $649 US which was highly competitive against its competitors. The same card can now be purchased at a price of around $450 US. Looking at some listings over at Newegg, we can see the GTX 980 Ti Gaming Golden Sample from MSI available for $399 US and an array of other custom models from EVGA and ZOTAC with prices close to $450 US (+/-). The reason this card is a great buy at this price is that most custom GTX 980 Ti cards can overclock really well. This leads to performance equal or better than the new GTX 1070 which has a starting price of $379 US with custom models retailing a bit higher than that. 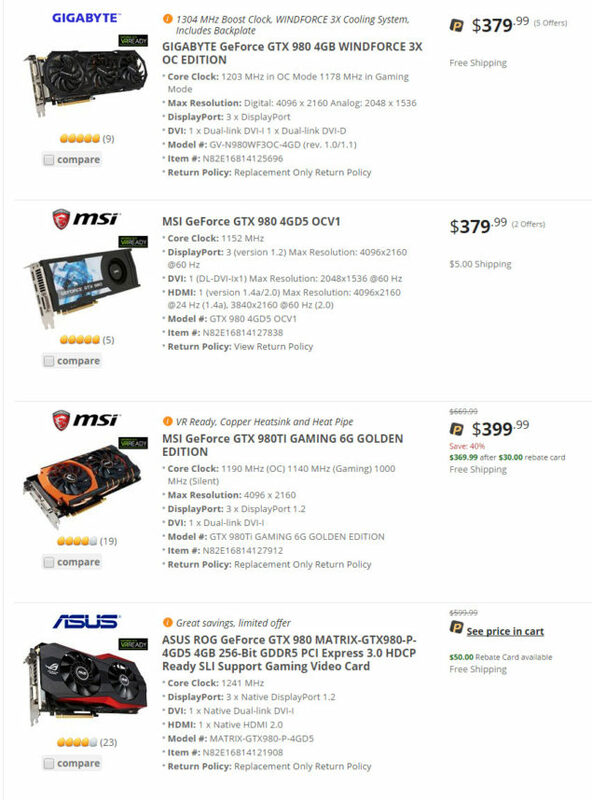 You won’t get the 2 GB extra VRAM or the lower TDP of Pascal but for those who have been waiting for a cheaper 980 Ti for SLI can look into such cards now. The GTX 980 Ti also is no longer in production so the cards you will see on retail now are probably the last units you will ever see available for sale. Do note that multi-GPU support isn’t ideal in most gaming applications hence it’s better to invest in a faster single chip graphics card which delivers great performance without the hassles of multi-GPU setups. The GeForce GTX 970 has also received a price cut of $25 US. The card was already selling close to $299 US and would now be available with a starting price of $279.99 US. 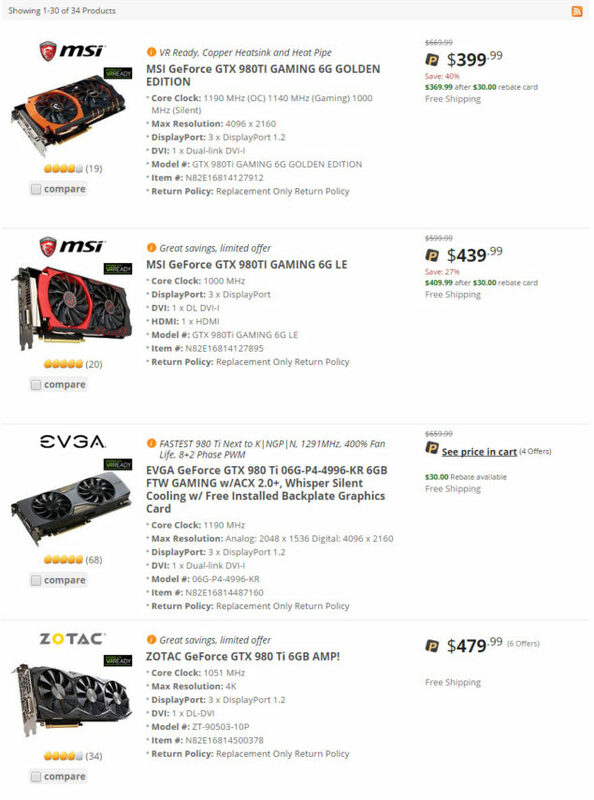 Newegg has listed down EVGA and MSI GTX 970 for $279 US. The GeForce GTX 970 graphics card has remained the most popular card on Steam for almost a year and has been the single biggest success for NVIDIA which the company is trying to accomplish again with the GTX 1070. While NVIDIA has no Pascal cards under the $300 bracket for now, they can look into the GeForce GTX 970 or upgrade to an SLI solution for better performance if they already have one. AMD has also recently introduced their new RX 480 8 GB card which will have great efficiency at a price close to $250 US while the 4 GB variant will be available for $199 US. NVIDIA is expected to launch their own sub $300 Pascal card soon as seen in a previous leak. The NVIDIA GeForce GTX 970 is fully VR compliant as it falls in the minimum VR specifications requirement from both HTC and Oculus. The NVIDIA GeForce GTX 980 remained the flagship Maxwell 900 series card for more than 6 months. NVIDIA had launched the graphics card at a price of $549 US and it remained the fastest card until the Titan X and 980 Ti were introduced. 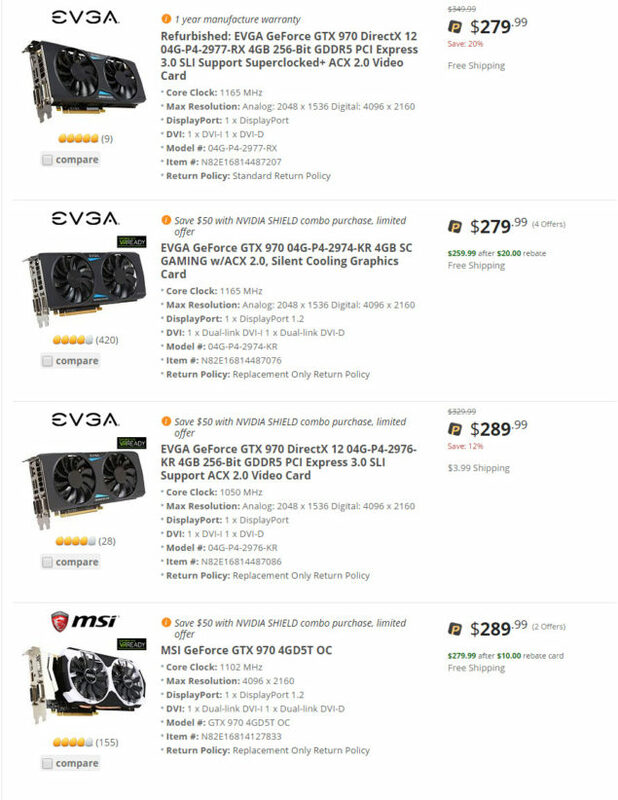 The GTX 980 was dropped down to $499 US and now selling for $379 US. The GeForce GTX 980 Ti custom models which are selling close to $399 US definitely feel like a better choice than the GTX 980 at $379 US right now. While GeForce 10 series has been launched with very good performance and efficiency figures, the GeForce 900 series are still a great option for many who are upgrading from their older graphics cards.